I’ve been trying to write this post for months. Last May, I finally watched the very last episode of Buffy the Vampire Slayer, after years of watching through all seven seasons. I sat down and tried to write about it then, but I couldn’t figure out what I wanted to say. So, I decided to put it off until I’d read all of season eight, which was released in comic books from 2007-2011. I finished it earlier this week, and sat down to write, but again: I couldn’t figure out what I wanted to say. I realized I had to just start writing my thoughts out, otherwise I don’t think I ever will. And I realized that what’s been holding me back isn’t a shortage of thoughts about the show, but lack of originality. Everything about Buffy has already been said. I’ve said before that at its heart, Buffy isn’t really *about* vampires. It’s really *about* being a teenage girl in the 90s. Everything about Buffy is so 90s and I LOVE it. Coming at the height of the “girl power” days, the show is about facing the figurative demons that we all face in our high school years, as well as, you know, literal demons. It’s about teenage romance and how you lean on your friends when your boyfriend turns evil and breaks your heart. Wanting to be normal when you feel like an outsider. And most of all, finding friends who support you and whose strengths complement yours, and how we’re stronger when we work as a team. Clearly, this is not a show that shies away from clichés or is concerned with being unoriginal. And still, I loved it. Welcome to Sunnydale High School/welcome to the hell mouth. Season one is relatively straightforward – it sets the tone for the show, juxtaposing high school (cheerleading tryouts, prom, etc.) with Buffy’s late-night vampire-slaying. It’s a solid start to the series, including a few small moments of subverting the predictable – for example, a creepy ventriloquist doll makes an appearance but isn’t the villain. And in other places, it totally embraces the predictable, like Buffy’s love interest turning out to be a vampire. Season two is about teenage romance; it’s the season that launched a thousand paranormal romances. Buffy falls in love with a vampire. It’s probably the best season as a whole, although I like the later seasons better because the show was still stuck to the tried-and-true TV plotlines in these early seasons. Season three is about learning who to trust. Buffy’s mom doesn’t support her vampire slaying, but she still has Buffy’s back. Then there’s Faith, another slayer who turns up in Sunnydale, and turns out not to be trustworthy. The season ends with the gang finishing high school, and they go out in a big way. Season five is about family. Of all the seasons, it is the most emotional, which is much needed after the preceding season. I don’t want to spoil too much, but Buffy gains a new family member and loses another. It has the highest stakes of any of the seasons – the season’s main villain (“big bad”) is a worthy foe, and Buffy goes to the greatest lengths to save the world. Season six is peak Buffy. It’s the darkest of all the seasons. Frankly, it’s about death, and the consequences of the gang’s choices and actions. This is my favorite of all the seasons – the writers became fearless about showing the characters’ flaws, to great effect. Season seven is about the legacy of Buffy the character, and Buffy the show. It’s about wrapping up loose ends, like the slayer legacy, which was foreshadowed over pretty much the entire series. It redeems a few characters after season six. Oh, and if you’re wondering how they followed up on six seasons worth of big bads, the final season’s big bad can embody ALL OF THEM. Jenny Calendar – The high school computer science teacher turns out to be a great ally to the gang, as she’s a Romani witch and introduces Buffy’s BFF Willow to Wicca. She’s also love interest to Buffy’s mentor, Giles. She remains beloved among fans mostly because her storyline ended abruptly and we weren’t ready for that! Buffy has a rep for being such a strong, feminist role model for teenage girls, but I honestly think Jenny Calendar is a better one because she’s strong and fearless and gives Willow a boost of confidence, where Buffy is often, well, a whiny, self-absorbed teenager. Oz – Oz shows up to be the level-headed, down-to-earth member of the gang at a time when they really need one of those, and then it turns out he has some supernatural abilities of his own. 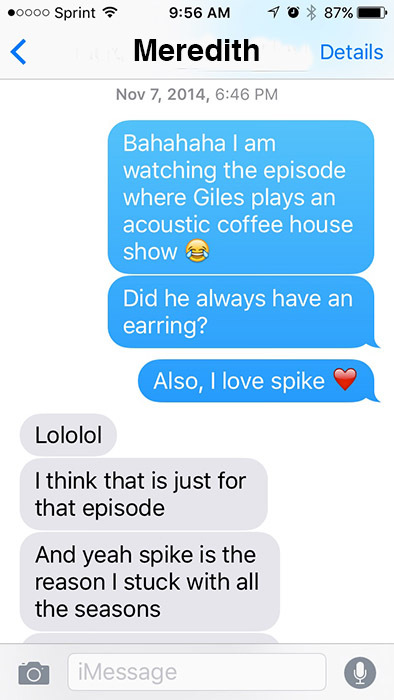 Spike – We meet Spike in season two, and Buffy (both the character, and the show) are never the same. He was written off at the end of season two, and I wasn’t sad to see him go. But about midway through season three, I missed him and was happy when he finally returned. “Nightmares” – This was the season one episode that convinced me to continue watching the entire series. Due to some force of evil or other, the gang’s worst nightmares come to life. It’s the first indication that there’s a bigger picture beyond high school and vampires. “Who Are You” – Faith and Buffy switch bodies. This episode only works because the actresses (especially Sarah Michelle Gellar) NAIL each other’s characters. It’s also the best foreshadowing of Buffy and Spike’s pairing. “Normal Again” – My favorite episode, the episode that has stayed with and haunted me, presents an alternate reality, where Buffy is in a mental institution and has been since the events of the movie (prequel to the series) started. “Once More, With Feeling” – The fantastically cheesy musical episode. It’s terrible and hilarious and perfect. And those of us who’ve been rooting for Spike since he showed up in season two finally get what we want. The musical episode of Buffy and Dr horrible's sing along blog may as well be the same show. “Conversations with Dead People” – Probably the scariest episode, but the reason I like it is that it tried to do something very different (tell one small story in service of the season’s larger story) through four different conversations all spliced together. It’s wise and funny and bittersweet, and very scary. I think the most effective foreshadowing on the show is Willow’s magic. Willow gets involved with magic in season two with guidance from Miss Calendar. Giles warns her not to get involved with dark magic, and she tries (eh, kinda) not to for the next few seasons. We see her fear of dark magic in season four, but fear won’t prevent her from giving in to it in season six, and it’s magical mesmerizing. Finally, the lore about the chosen one, the vampire slayer, comes up in season two, is explained in the finale of season four, and is a major plot point in the final season. The resolution that is reached in the TV series becomes the set up of the season eight comics. I want to say more, but it’s long and complex and spoilery (not that I haven’t already dropped a ton of Buffy spoilers) but I realized this post is already about 1600 words long, which is probably enough for a show that I claimed everything about it has already been said. Now I kind of want to start back at season one, episode one and watch it all again. I think I’ll wrap up this post now before I actually commit to re-watching the entire series.